Telemundo Center, located in Miami, is the new unified home of Telemundo and Telemundo Deportes with 15 studios and 500,000 square feet of space for up to 1,500 employees. 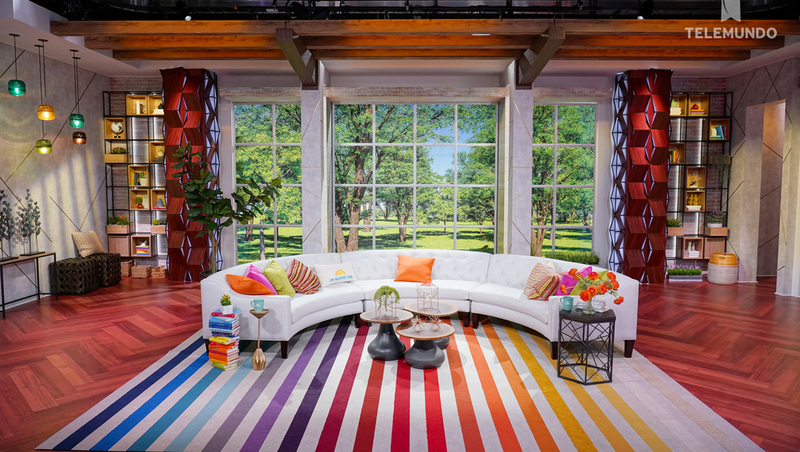 “Un Nuevo Día’s” move to the facility includes a new set with a vibrant, light and airy design that blends homey areas with modern news looks. 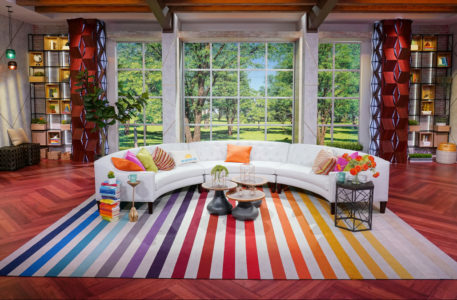 The set was designed by Mercedes Guzman of Cisneros Studios in Miami with EP Juan Carlos Sosa, Art Director Indira Cazorla and technical support from Gustavo Core and Miguel Angel Chiquito. The anchor desk for “Un Nuevo Día.” Photos courtesy of Telemundo. In the center of the space is a hexagon shaped riser with roundtable style desk perched atop, specifically designed to play into the chemistry between hosts Marco Antonio Regil, Rashel Diaz, Adamari Lopez and Zuleyka Rivera. Nearby, a gently curving horizontal banded frame surrounds vertically mounted video panels and, behind that, a faux brick background. Perched atop this is a unique header element with crisscrossing white lines with cutouts for studio lighting instruments. This home base area echoes many current trends in modern news set design, while the stonework adds both warmth and texture to the wall and serves as a jumping off point for other areas.